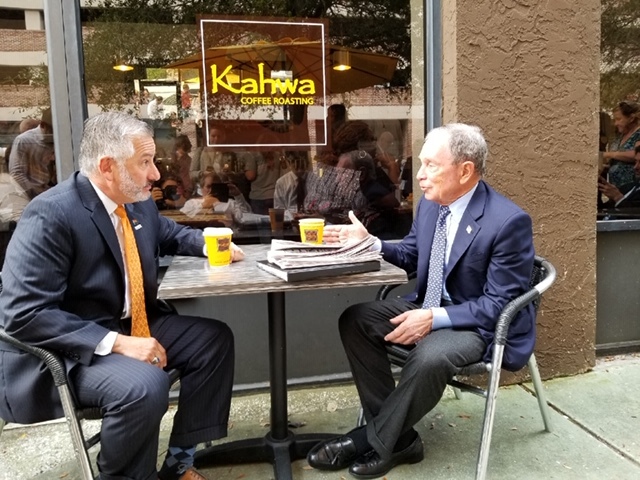 Bloomberg, former New York City mayor and currently a United Nations special envoy for climate action, met Thursday morning with St. Petersburg Mayor Rick Kriseman. BRONTE WITTPENN | Times From left, New York City Mayor Michael Bloomberg speaks to a crowd during a press conference addressing climate change at Albert Whitted Park in St. Petersburg on Thursday, January 3, 2019. The mayors appeared to talk about climate change including issues revolving around sea level rising, flooding, tides and the use of plastic straws. St. Petersburg was recently awarded the The American Cities Climate Change Challenge award presented by Bloomberg Philanthropies. The award is an opportunity for 25 ambitious cities to accelerate their efforts to tackle climate change and promote a sustainable future. Michael Bloomberg, the billionaire former New York City mayor and potential presidential candidate, is awarding St. Petersburg $2.5 million to St. Petersburg to enhance the city's efforts to combat climate change. The $2.5 million worth of technical resources is supposed to help St. Petersburg significantly expand access to solar energy, particularly among lower income residents, promote transportation alternatives and reduce energy use in public and privately owned buildings. Bloomberg said his foundation, Bloomberg Philanthropies, picked city's with committed mayors and ambitious but realistic plans for cutting carbon emissions. While Washington leaders mainly talk about fighting climate change and President Trump opposes committing the country to cutting carbon emissions, Bloomberg said, mayors are stepping up. 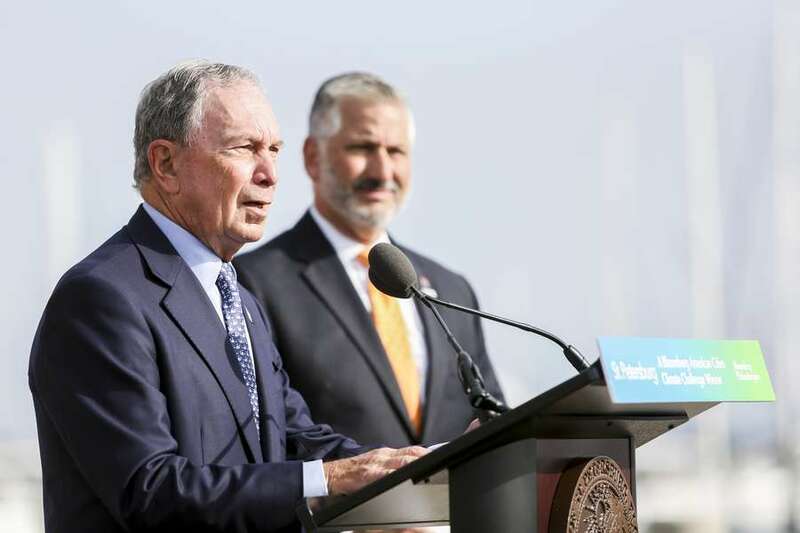 "Mayors really can't ignore the risks that we face from climate change because their constituents are already feeling the effects," Bloomberg said at a news conference with Mayor Rick Kriseman at the city's waterfront. "They really do expect city hall to take some action when someone's child is suffering from asthma because of dirty air, or when their house floods because of a hurricane. They don't call their member of congress. They call their mayor." Bloomberg, 76, began the day with a coffee chat with Kriseman surrounded by news cameras at Kahwa coffee shop. He finished with a stop at Paul’s Chicago Pizza, where he hailed the efforts of volunteers Mom’s Demand Action, a group advocating for stronger gun laws. Combating gun violence and climate change are two of the top priorities for Bloomberg, who has spent millions promoting those causes. At the pizza restaurant, he recounted the difficulty of talking with the parents of children killed by gun violence as New York Mayor for 12 years until 2014. "We really are making progress state by state, and I refuse to fall into the trap of making this a partisan issue. Everybody, no matter what their political persuasion should want safety for their families and their children," said Bloomberg, noting how the massacre in Parkland last year led to tougher gun laws across the country. "Here in Florida lawmakers finally defied the (National Rifle Association) after many years of bowing down to them," told the volunteers for Moms Demand Action. "And then in the midterms you helped get out the vote for gun sense candidates and 38 of them won their races across the state." Bloomberg is one of nearly two dozen Democrats running or seriously considering running for president in 2020. Formerly registered as a Republican and without party affiliation, he recently changed to Democrat, an obvious step in the direction of running. But he laughed off the suggestion that Tampa Bay's outsized electoral significance drew him to St. Petersburg Thursday. "It would be very expensive if you had to give a gift to every city where you're looking for votes," quipped Bloomberg, who made much of his fortune founding a financial services, media and software company that bears his name. Other cities receiving this round of awards include Atlanta, Boston, Charlotte, Chicago, Cincinnati, Columbus, Honolulu, Indianapolis, Los Angeles, Minneapolis, Philadelphia, Pittsburgh, Portland, Saint Paul, San Diego, San Jose, Seattle, St. Louis, and Washington, D.C.
"This American Cities Climate Challenge Award from Bloomberg philanthropies will provide our city team with the resources to deliver real action in the building and transportation sectors, our two biggest sectors contributing to greenhouse gas emissions in our community," Kriseman said. In a part of the country most vulnerable to climate change and sea level rise, Krisman has made environmental sustainability a central part of his agenda, but also has been dogged by polluted wastewater and stormwater spills and criticism of his administration's responses. Bloomberg said he was unaware of those problems.